The long and boring road. This web page comes to you from just outside the Forte de Santo Antonio da Barra in Salvador, Brazil (S13.009568 W38.532072). A good place to park for the night in a big city. The WHS of the Centro Historico is only a short taxi ride away. The 2350km from Belem to Salvador has been a long hard drive for K-Nine and Mog, only enlivened by visits to Sao Luis and the turtle sanctuary at Praia do Forte. Our original route involved a fairly leisurely drive down the coast of North East Brazil thru Sao Luis, Natal, Olinda, Maceio and Aracaju. However in Belem, Mick and Mo (in Mel) decided that in order to meet their shipping deadline for getting to Australia and still complete the loop down to Ushuaia they would have to speed things up. Because Mel is capable of considerably higher speeds than Mog or K-Nine (100kph rather than 75kph) Mick and Mo decided to follow the coastal route but traveling farther each day, whilst K-Nine and Mog opted to cut out a chunk of the coastal road and take the more direct (and boring) inland route thru Terisina. Before we started our run south we all visited the coastal town of Sao Luis. 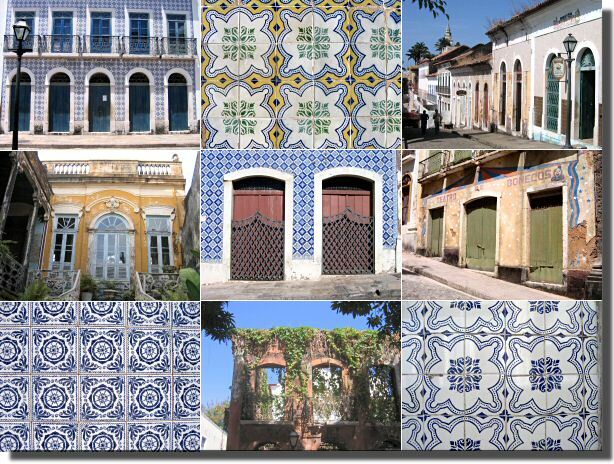 Depending on your point of view, the old town of Sao Luis is either "one of Brazil's architectural gems" or a bit of a slum with some derelict buildings covered in rather nice tiles. UNESCO favor the "architectural gem" point of view. But if you wander round some parts of the old town in the evening, when all the habitable buildings have their shutters closed and the rats are scurrying from one bricked up building to the next you may not agree. Still there are some nice restaurants and you can safely park nearby (opposite the bus station at S02.530252 W44.306805). The reward at the end of our long and boring road was a visit to the turtle sanctuary at Praia do Forte. Described in one of our guide books as "a charming, tranquil fishing village with sand streets and lovely beaches" - alas the authors can not have visited Praia do Forte in the last five years! We did manage to find a bit of waste ground (S12.576563 W38.004420) within 200 metres of the sea to spend the night, but I expect it will have been built on by the time you read this. 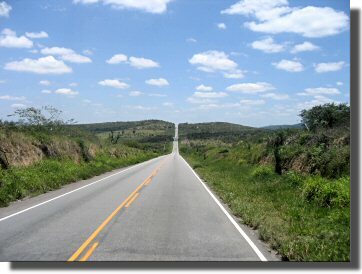 Note that the BR099 coastal road from Praia do Forte to Salvador is excellent but the link road from the BR101 near Entre Rios to Porto Sauipe is the worst 50km of road we have encountered so far in South America! Home - This page last changed on 2006-11-08.